James Chalmers : Niue and New Guinea 1867-1885. 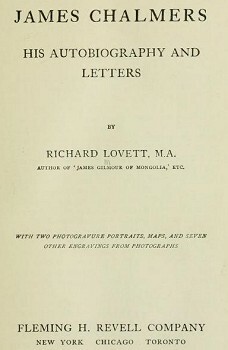 Lovett, Richard: James Chalmers- His Autobiography and Letters. Fleming H. Revell, New York, 1903. George Dorian Company, New York, 1920. These multiple sources were dentified by Herve Magnificat, the Surf Blurb, May 5, 2014. 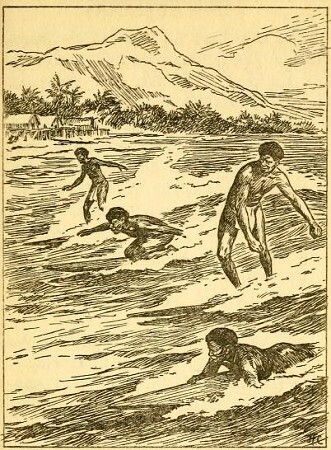 Herve noted: "Missionaries who lived in the Pacific area during the 19th century are accused to have forbidden or discouraged many Polynesian traditions including surf-riding. That makes James Chalmers (1841-1901) an unusual specimen of 19th century religious in Oceania, maybe a unique one: he tried to surf, reported it, and got involved in waves during all his life. Each volume is written for young people by a well-known author in a bright interesting style and has a specially designed pictorial cover in full colours by John F. Campbell, as well as black and white illustrations throughout. It was while thus detained against his will on remote and solitary Niue that Chalmers nearly lost his life in the fascinating and exciting, but except to a native, excessively dangerous pleasure of surf swimming. "During our stay on the island, I nearly lost my life. I was greatly interested in the surf swimming, and often watched the lads at it. One day the sea was particularly big, and I determined whilst bathing to try and run in on a sea with a plank. I got too far out, and was sucked back to the big boulders, and the seas washing me about, I got much bruised and cut. I can remember feeling that all was lost, when a great sea caught me, and threw me on to a boulder, and I felt now or never, and with a terrible effort I clung to it, and then rising, gave one spring, and landed where help could come to me. I was picked up, and carried to the house. I was in bed for several days. I never again tried surf swimming." 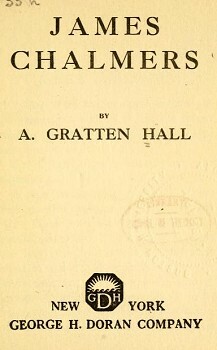 Of course Chalmers had to stay longer than he had intended at Niue, as there was no ship to take him and Mrs. Chalmers on to the Hervey Islands. He was not discouraged, and never thought for a moment of turning back. at Niue he picked up a few more adventures, and very nearly lost his life. The natives of the coral islands of the Pacific Ocean are very fond of the sport of surf- swimming. They get a long piece of wood, run out into the sea, and lying on the plank, let the strong waves rush them back through the heavy surf to the shore. It is a very exciting game, and the natives are very clever at it. Chalmers watched the lads surf- swimming, and thought he too would try the game. But he chose a very rough day, and instead of coming swiftly and smoothly to shore on the rolling wave, he got too far out, and was sucked back by the sea. The waves dashed him about like a cork, and he was badly bruised on some boulders. into a wave, and just reached the shore. But he had to be carried from the beach to bed, and after that near shave he never tried surf- swimming any more. In the very sports of children, Tamate could join, with zest and unfeigned satisfaction to himself. Surf-swimming with the youths at Nine, playing football with the boys at Kwato, engaging in high-jinks at a Sunday-school picnic, he obliterated all thought of the years and work and cares that had intervened, and for the moment recalled the spirit of his boyhood's days on Loch Fyne-side. "We undress, and clothe ourselves in bathing costume ; a great shout ; the enthusiasm and excitement reaches its height ; the missionaries are bathing ! What ? missionaries ducking them, racing with them, diving with them, swimming under water with them ! What next ? A missionary dives some distance out, crawls along the bottom, catches hold of a pair of heels, and over the owner goes, alas ! to be nearly drowned. Never mind who the owner was, or who the missionary was ; but, in years to come, that bathing will be remembered." In the wreck of the vessel they had lost everything. no boots, and my watch which had been the gift of the poor of the High Street oGlasgow.' But, perhaps, to Chalmers the most grievous part of the disaster was the delay which it caused. No ship was likely to touch at Niue for some time, so there the shipwrecked company had to stay. There was nothing very much for them to do, and that sort of life did not suit a big, strong, restless fellow like Chalmers. He always wanted to be at something, no matter what it was, so sometimes he went down to the beach and watched the natives surf- swimming. It was great fun to come sailing in on the crest of a huge wave, and looked so easy that Chalmers made up his mind to have a try. One day he was bathing, and although the sea was very rough he thought it would be all the greater excitement to swim through it. He got a flat piece of wood and pushed it before him just as he had seen the little black fellows do. Presently a great breaker came rolling towards him.
' Now or never ! ' he said, as he threw himself on the board and pushed into the wave intending to be carried safely ashore on its crest. But he missed the proper moment, and in an instant found himself sucked back among the coral and tossed on its sharp, ragged edges. felt certain he would be dashed to pieces, but just then he made one last desperate effort. He clung to the rock ; the racing water almost tore him from it. He shouted and tried to reach a safer place, where help could reach him. Natives hurried to his rescue and brought him ashore, but he had to go to bed for several days and never again did he attempt the difficult art of surf-swimming. Sometimes Tamate went down to the beach and had a game with the boys and girls, greatly to their delight. He sailed their model canoes with them, and helped them at whip-tops. They were very fond of playing at cat's-cradle, but there was most excitement when they played their spear game. In New Guinea the boys have far more time to play than the girls, who at a very early age have to plant food, fish, carry wood, and nurse the babies. Sometimes they get off, however, and then they romp and dance along the beach. Surf-swimming and bathing are always great fun, but some one has always to be on the look-out for crocodiles. Thain, A. R.: James Chalmers (Tamate) : Missionary Hero and Explorer : a life sketch. Envelope Series : Vol. 11, No. 1, April 1908. If there had been a Carnegie Hero Fund in those days James Chalmers might have won half a score of medals as a life-saver. He was a strong and fearless swimmer, and when only ten years old he saved the life of a schoolmate who was about to perish in the swollen waters of the Aray River. Some years after this he saved the life of a child who had fallen from the end of a quay, and while he was in college he saved, at different times, six of his fellow students from death by drowning. Time cannot be taken to tell how often and how freely he risked his life for the good of others in the surf of the Southern Pacific, but during all of that time he was an unofficial but efficient member of the Life Saving Service. Their second peril came at Niue, an island of the Loyalty group. There the "John Williams" drifted against a reef and was pounded to pieces by the surf. There was no storm at the time and no lives were lost; but again the missionaries lost their outfit. But did the surf of the South Pacific quench their zeal? This is the word which they sent to their friends in England: " Do not for a moment suppose that we feel discouraged; we have no intention of turning back, and leaving our mission work. God forbid! If possible we shall go on now. All our trust is in the Lord." The third peril came to Chalmers alone, and, brother of the waves though he was, it came very near being his last. While detained at Niue waiting for a ship he thought that he would learn the art of surf swimming. The boys of the island, prone on a plank, caught an incoming wave by its foaming crest and rode it at racing speed until it reached the sand. Boyish still, he coveted the thrill of a new adventure, and resolved to become the big brother of those black boys. Let him tell the experience in his own words. swimming, and often watched the lads at it. One day the Sea was particularly big and I determined whilst bathing to try to run in on a with a plank. I got far out, and was sucked back to the big boulders, and the sea washed me about, and I got much bruised and cut. I can remember feeling that all was lost, when a great sea caught me, and threw me on a boulder, and I felt now or never, and with a terrible effort I clung to it, and then rising, gave one spring, and landed where help could come to me. I never tried surf swimming again." Lovett, Richard: Tamate; the life story of James Chalmers told for young people. Fleming H. Revell, New York, 1904. All the children are very fond of playing cat's cradle, and they are much cleverer at the game than we are. The boys have many merry games, and, like British boys, they have different games for different times of the year. Fathers and elder brothers help them to make pretty canoes, with neat sails and paddles. Some of these are large enough for a small child to get inside, and paddle about in shallow waters ; others are simply toys. They are fond of mimic warfare, and have toy bows and arrows, clubs, and throwing-sticks sharpened like spears. The older men take great interest in this pastime, and teach the boys how to use their arms like warriors. The girls have not many games; they are fond of playing and dancing on the beach, and they take great care of their wee sisters and brothers, and help to plant food, to fish, and to do other work. The sea is a grand playfellow for all the young people, and they spend more than half their leisure time in or on the water. Even the small children can swim, and the boys are fond of practising surf-swimming. We have a great deal of surf. When the waves break one behind another, often three or more lines of them, and send up grand showers of white spray, then is a fine time for the boys. They get a piece of wood plank, about a foot wide and two feet long, and hollow a place at one end for the arm to rest in ; then swim out, away beyond the wild breakers. they throw themselves upon it, resting one arm on the board, and ride in on the very top of the high waves amidst the white surf. Often I lose sight of them altogether can see nothing but the mass of foam and spray, and I think they must have been carried away ; but they always turn up safe and sound on the beach, where they give themselves a good shake. A few moments in the hot sun, and they are dry, have got a new supply of breath, and are ready for another start. I think it must be a fine sensation to be carried in on the top of those big waves. T.C. & E.C. Jack, London; E.P. Dutton & Co., New York, . James Chalmers- His Autobiography and Letters. Geoff Cater (2014) : Lovett and Hall : James Chalmers, 1900-1910.